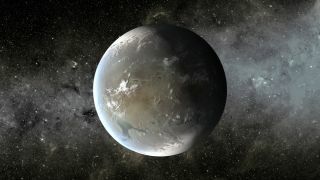 An artist's image of Kepler-62f, a rocky world 60-percent larger than Earth that could boast oceans of water, given the right atmosphere. A small, rocky planet could host liquid water on its surface, if it also contains a carbon-dioxide atmosphere, researchers say. The planet, which scientists have dubbed Kepler-62f, has a diameter 40 percent larger than that of Earth, and could contain oceans of water if its atmosphere keeps the planet warm. Kepler-62 is a small, dim star two-thirds the size of the sun and only one-fifth as bright. Five planets orbit the star, which lies 1,200 light-years from the sun in the constellation Lyra. Only two of these planets lie in the habitable zone, the region around a star in which liquid water could lie on the surface of a planet. Liquid water is thought to be a necessary ingredient for the evolution of life. Both planets are super-Earths — rocky exoplanets larger than Earth. At the time it was discovered , Kepler-62f was the most Earth-like planet known, in terms of size and orbit. The other planet, Kepler-62e, lies at the inner edge of the habitable zone. The planet is about 60 percent larger than Earth. In modeling orbits, Shields and her colleagues were unable to find one that could sustain liquid water on its surface. "[Kepler]-62e is likely too hot for liquid water," she said. Kepler-62f lies farther from its sun — in fact, it is the farthest out of the five planets known to orbit the star, which it circles once every 267.3 Earth days. Scientists could only measure the radius of the planet. In order to estimate its mass, and thus its density and composition, they relied on the statistics of previous studies, and concluded it was likely either a rocky planet or one that hosted solid water, rather than a gas giant. Shields put the planet into a simulation with an Earth-like rotation and a carbon-dioxide atmosphere. She then studied it with different obliquities — in other words, the angles at which it tilts in respect to the sun. In one case, the planet boasted an Earth-like obliquity of around 23 degrees, while in another, it had a sharper tilt of 60 degrees. Both scenarios resulted in the freezing of surface water, creating an icy snowball planet. However, in the simulation of the planet with a tipped orbit, temperatures at the southern pole rose above freezing during the hemisphere's summer months. "At its southern hemisphere summer, [the planet] gets more of the max effects," Shields said. "This could result in melting ice sheets." The Kepler-62 system hosts five planets, two of which are super-Earths in or near the habitable zone. Periodic melting could allow the atmosphere, ocean and some of the radiation from the star to mix. These three things are thought to be helpful ingredients for the development of life. But the exoplanet isn't limited to a frigid, half-melted existence. With a sufficiently large carbon-dioxide atmosphere, Kepler-64f could suffer global warming severe enough to at least partially melt the frozen oceans. "It could sustain surface liquid water if the atmosphere had greenhouse gases," Shields said. A paper detailing the research has been submitted for publication.